A resurgence unique to the beverage industry is taking place in the world of Bourbon whiskey. Until a few years ago, Bourbon was associated with the Deep South, but the recent rediscovery of classic cocktails using Bourbon has distillers scrambling to meet demand. Shortages have become increasingly common with some brands putting customers on waiting lists. "I can’t find Pappy Van Winkle anywhere. What do you have that tastes like it?” have become common questions for retailers. When one of our customers asks that, we recommend hosting a Bourbon tasting. If your guests are experienced connoisseurs, single barrel, small batch or specialty Bourbons should make up the tasting roster. People who are familiar with Bourbon know what to look for and won’t need much guidance. Their observations can give new insight into the spirit’s complexities and the distiller’s art. Beginners will benefit from examples of Bourbons from different regions: Kentucky vs. Tennessee, Japan vs. Canada are good starting points. Look into other regions producing Bourbon (contrary to popular belief, Kentucky doesn’t hold an exclusive right to the name "Bourbon.”) and present those as examples of distilling from their respective states. Our staff is a great resource and can offer suggestions of each style. Limit the number of samples to three or four for beginners; six is ideal for connoisseurs. And limit the size of each sample to one ounce. The last thing you want is guests so buzzed that their taste buds no longer connect to the cerebral cortex. Colonial carries measuring pourers that are designed to dispense an ounce at a time; they’re the way to go for your tasting event. The glass of choice is a Bourbon tasting glass like the Glencairn or Neat whiskey glass, a good quality wine glass like Riedel Port or Riesling, or a Cognac or Brandy snifter. No plastic cups or straight sided glasses, so save the Solo cups for the beach and the rocks glasses for your next cocktail party. You’ll need one clean glass per guest for each product you pour. This is important for back and forth comparison, and for different tasting scenarios like adding a few drops of water or an ice cube. List each of the products with a brief description taken from the product website. Under the description leave room for tasters to describe appearance, aroma, taste, finish. Since you will be leading the tasting, do a little research and preparation as you visit the websites preparing the program. Distillers’ websites are a good source for information about their products. 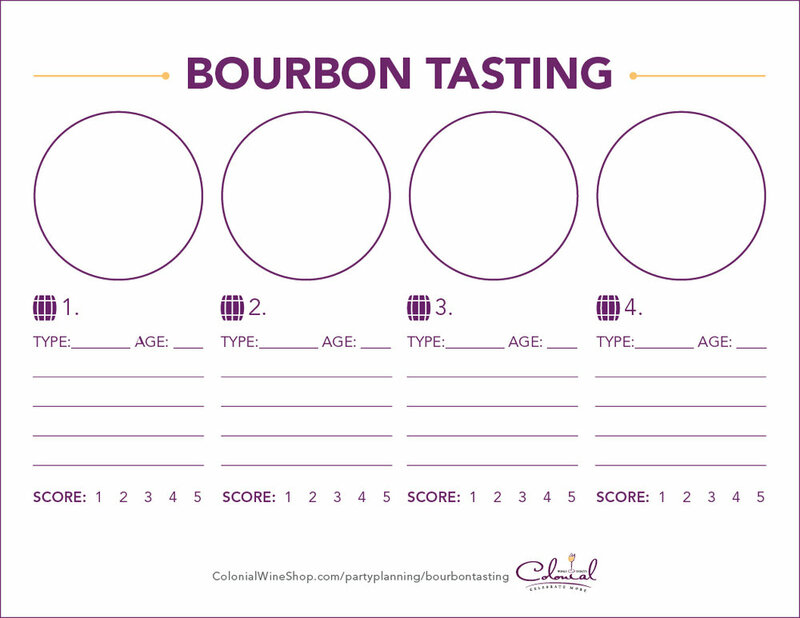 Make notes about the flavor profiles and the four areas to examine throughout the tasting process. Program example attached. A tasting place mat is a very nice touch. Use a paper mat large enough to arrange the glasses on — 8 ½ x 11 is a good size. Print the names of the Bourbons under each glass. Add some notes if you really want to impress your guests. There can be several rounds of tasting the same products. It is a good idea to repeat the exact same process with a few drops of room temperature water to each glass. Notice and discuss what the water does to the four descriptors of the bourbon. Does the color lighten? Does an alcoholic hot nose soften? Are flavors more mellowed and not as hot? What about the finish? Has it changed? Go through the same steps and analysis as above using one or two ice cubes. Mix with cola, club soda, ginger ale, etc. Discuss how to use in cocktails like the Manhattan. Which would be best? Expand the conversation. One last, but vital, point about hosting a Bourbon tasting: make sure designated drivers are available! Or allow your guests a few hours between the last pour and their departure from the event. You could even turn it into a sleepover with breakfast the next morning—whatever you do, don’t let your guests get behind the wheel after they’ve been drinking. Celebrate more responsibly, so that you and your guests can enjoy your next tasting event. Let the celebration aficionados at Colonial set you up for the transition into the social season with recommendations for every get together.